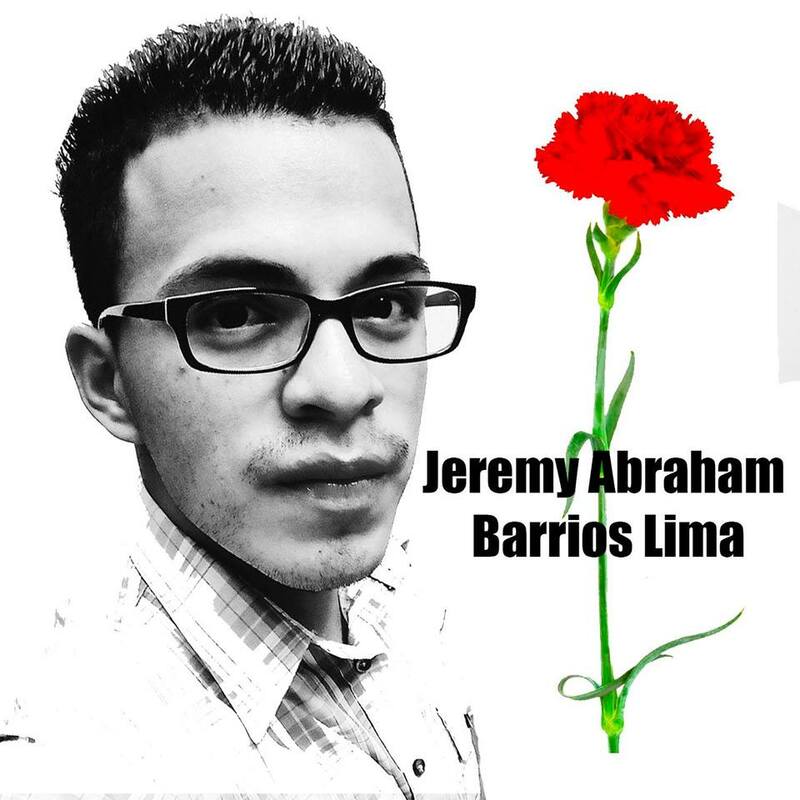 On November 12, 2016, in Guatemala City at approximately 5:30 PM, JEREMY ABRAHAM BARRIOS LIMA was shot and killed. He was 22 years old, single, graduated from high school with a focus on computer science, and was an activist and human rights defender. He worked for the last two years with CALAS as the Assistant to the General Director, tasked with institutional operations and handling sensitive information. He is survived by his mother and two younger sisters. Worked for the past two years as Assistant to the General Director, tasked with institutional operations and handling of sensitive information. Was a former student leader in the normalista (teacher training) movement; former student at the Central Teacher Training School for Boys (Escuela Normal Central para Varones – ENCV), and remained active during the 2013 against the cancellation of the normalista teaching degree. In the days prior to the murder, he did not receive any anonymous death threats, nor perceived any kind of abnormality. The crime scene was under the care of the Public Prosecutor’s Office for Crimes Against Life. In the coming days, in response to the request by CALAS, the case will be transferred to the Unit of Attacks against Human Rights Defenders of the Public Prosecutor’s Office of Human Rights. It is already known that at the moment of the crime, he was alone, that none of his personal effects were taken (his wallet was together with his two cell phones, his personal identification card, debit card, and bag) and that he received two bullets directly to the head. The National Civil Police, the Public Prosecutor’s Office, and the National Institute of Forensic Science (INACIF) carried out the initial proceedings. The online newspapers Soy 502 and Nuestro Diario published articles about the murder. In actively condemning this crime, CALAS makes the following national and international URGENT ACTION AND PUBLIC DENOUNCEMENT, making the Human Rights Ombudsman (PDH) and the Unit for the Protection of Human Rights Defenders in Guatemala (UDEFEGUA) aware of the crime, as well as Front Line Defenders, Protection International, Amnesty International, the Inter-American Commission of Human Rights, the European Union embassy in Guatemala and the United Nations High Commissioner for Human Rights through its Guatemalan offices. As CALAS, we reiterate that we are committed to ensuring that this case does not remain in impunity. We stand in solidarity with his mother, sisters, and other family members, as well as the Guatemalan human rights community. We expect action from the justice system so that this case does not remain in impunity.